The Oktoberfest mustard sold year round. There aren’t many things that can’t be topped with a Bavarian Mustard. For centuries, its sweet and slightly spicy profile has been the condiment of choice when serving traditional Bavarian meals, topping weisswurst and dipping pretzels. 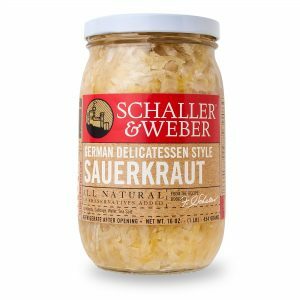 You’ll find that same versatility in Schaller & Weber’s all-natural Bavarian Sweet & Spicy Mustard. Our recipe doesn’t just pair well with our products, it’s ready to become your go to mustard for every dish. 9.5-ounce squeezable bottle. Foodservice size available.